Thrilled beyond belief to have acquired a published family cookbook filled with old-time recipes from my two great-grandmother’s on my biological Father’s side. Today I made great grandma Bertie’s banana pudding. My first time ever making a meringue and first time making homemade pudding that didn’t involve a box. In a medium size boiler, combine sugar, flour and 2 whole eggs, one at a time, beating after each. Add the egg yolks, saving the whites for the meringue. Beat until well mixed, slowly stir in the milk and 12 ounces of water. Cook slowly over low heat until pudding consistency. Remove from heat and stir in butter and vanilla. Stir pudding until it cools completely OR place plastic wrap directly over pudding and refrigerate until cool. To make meringue, beat egg whites until stiff, add cream of tartar and powdered sugar slowly. Lightly butter a baking dish, place a third of pudding in bottom of dish. Slice bananas 1/4 inch thick, place a third over the pudding. Cover bananas with single layer of vanilla wafers, and repeat layering. 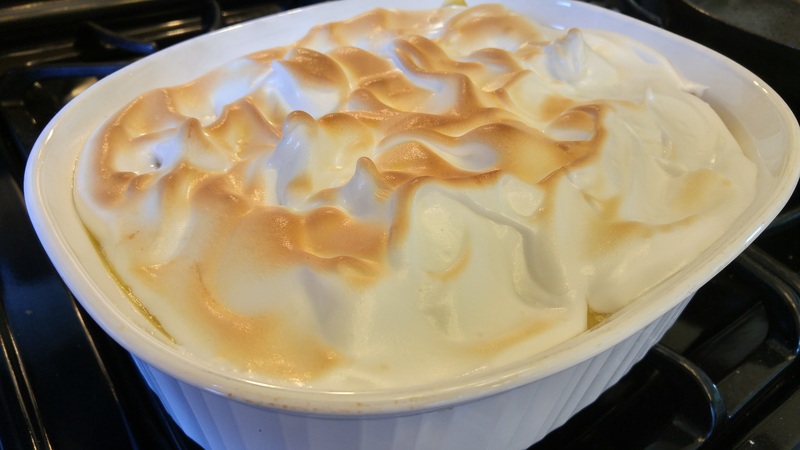 Spread with meringue and brown under the broiler.